With the capabilitities of the new supercomputer Blue Waters, Beckman faculty member Klaus Schulten and postdoctoral researcher Juan Perilla and their collegues have determined the precise chemical structure of the HIV capsid, a protein shell that protects the virus’ genetic material and is key to its virulence. For Beckman faculty member Klaus Schulten, Blue Waters has opened up a sea of possibilities. The recently launched Blue Waters supercomputer is one of the most powerful systems in the world, offering sustained performance of one petaflop (that is, a quadrillion mathematical operations per second) on a range of scientific and engineering codes, and offers more than 25 PB (25 million gigabytes) of usable storage. 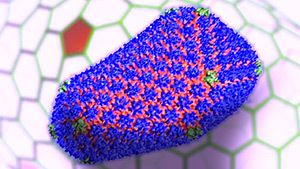 Schulten’s Theoretical and Computational Biophysics Group was one of three chosen to participate in the Blue Waters acceptance test phase, helping to benchmark the supercomputer’s performance using its molecular dynamics program NAMD on a structure with 100 million atoms. It was also one of just a few groups chosen to use and test the machine while construction was being completed. Schulten’s group had been preparing for the launch of Blue Waters since 2007, when plans for the machine were first announced, making sure that NAMD would be ready to take on the challenge of petascale computing. And this preparation paid off, because just as Blue Waters was coming online, Schulten’s colleagues at the University of Pittsburgh approached him with an irresistible problem: could he help them to solve the structure of the HIV capsid? “We were challenged with describing an extremely large structure. It was a total coincidence that it happened at the very moment when Blue Waters was available,” said Schulten. “Five years ago, this breakthrough simulation of the HIV virus wouldn’t have happened. At that time, the biggest computer could only handle a million atom simulation.” Together with the experimental collaborators at Pittsburgh, Schulten’s group was able to construct a full model of the HIV capsid, atom by atom—64 million atoms in total, to simulate on Blue Waters. Possessing a chemically detailed structure of the HIV capsid allows researchers to further investigate how it functions, with implications for pharmacological interventions to disrupt that function. Watch a video about Klaus Schulten’s research on the HIV capsid. Schulten is not the only Beckman researcher who uses the power of Blue Waters to facilitate advances in research. Five other Beckman faculty members are also using Blue Waters on research projects. Aleksei Aksimentiev’s project, entitled “Molecular Mechanism of DNA Exchange,” examines the repair of double-stranded DNA breakage in order to determine the molecular mechanism of the process—how one DNA strand is transferred from one DNA molecule to another. Narayana Aluru is using Blue Waters to perform high-accuracy calculations of the electronic structure of two condensed matter systems of interest: water adsorbed on graphene and hexagonal boron nitride (h-BN) surfaces. “We are now tackling some unique problems that would not be possible without Blue Waters,” said Aluru. His project, “Quantum Monte Carlo Calculations of Water-Graphene and Water-h-BN Interfaces,” will provide unique insights to those attempting to develop effective models of the electron correlation in these materials. Zaida Luthey-Schulten’s project, “C. Crescentus Cell Division Using Our In-House Lattice Microbe Simulation Program,” focuses on the dynamics and spatial heterogeneity of key regulators of chromosomal replication and cell-cycle timing. Blue Waters will be used to perform stochastic simulations of the reaction models on the whole cell level. Her second project, “Interactions between Ribosomal Signatures and 5’ and Central Domain of the Ribosomal Small Subunit Using NAMD 2.9 Accelerated by GPUs,” looks at the assembly of the pre-30S ribosomal complex. In this instance, Blue Waters will provide molecular dynamics simulations of the ribosomal assembly process. Quantum mechanical effects play an essential role in chemical and biological processes. Nancy Makri’s group has developed a rigorous but practical quantum-classical path integral (QCPI) methodology, in which a small quantum mechanical system is treated by full quantum mechanics while the effects of the environment are captured via classical trajectories. Implementation of the project, “Quantum-Classical Path Integral Simulation of Proton and Electron Transfer,” on Blue Waters allows for the simulation of multiple proton transfer along water chains and in biological channels and of bridged electron transfer with unprecedented accuracy. This article is part of the Summer 2013 Synergy Issue, a publication of the Communications Office of the Beckman Institute.